In this post, I offer additions to my dungeon master’s tools, notes on miniatures, and some tavern decor. In October 2013, when I presented my photo guide to dungeon master’s tools, I still ran fourth-edition Dungeons & Dragons, which meant the combat encounters typically featured poster maps or dungeon tiles. Fifth edition’s quicker, more numerous fights mean I’m sketching most encounters on a grid. In addition to using dry- and wet-erase battle maps, I sometimes draw dungeons on Gaming Paper. This paper resembles gift wrap, except rather than balloons or Santas, it features a 1-inch square or hex pattern. Unlike erasable maps, the paper offers permanency, so you can store and pack the maps without rubbing marks away. Plus, you can draw a bunch of maps before a game without running out of flip-mat. Do not accept this compromise. For fifth edition, set giant figures on huge-size, 3-inch bases so these monsters take the proper amount of space on the battle map. I’ve used the large-to-huge expansion rings that came in the old Monster Vault, but this only saves me the five minutes needed to cut 3-inch disks from cardboard. Every time a new line of randomly packaged miniatures reaches stores, gamers protest the random assortments. Many people insist on buying exactly the figures they need and believe that the blind packages prevent them from getting what they want. But they can avoid the random packs by getting figures as singles from internet resellers. If you want common figures rather than the splashy rares, then singles come cheaper. When a new set arrives, I typically buy some boxes to start a collection, then buy singles to fill gaps and to get groups of useful figures. For Tyranny of Dragons, I wound up short some of the flying dragon figures. The dragons look great, but I balked at their steep prices as singles. So the Attack Wing Miniatures Game Starter Set seemed like an ideal purchase. 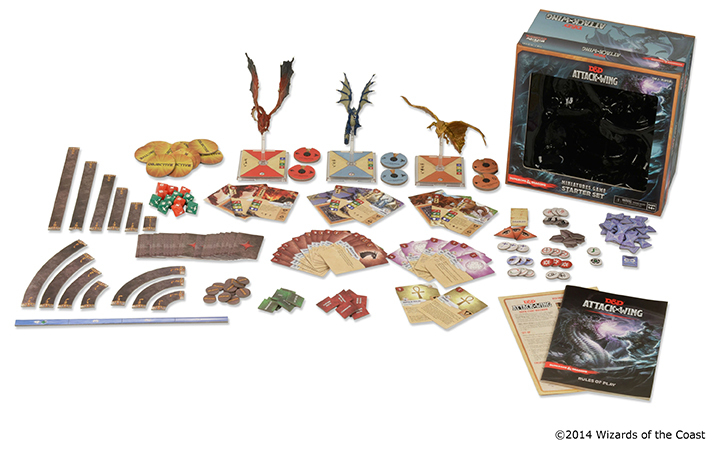 The box packs 3 dragon figures like the ones from the Tyranny of Dragons miniature set. These would cost much more as singles. Plus the box includes the game. The drawback: The Attack Wing versions only fit atop shorter posts intended to work with the game’s bases—bases too big for D&D’s one-inch grid. The good news: The short posts fit the Tyranny of Dragons bases. Your players will only notice how cool the Attack Wing dragons look, not that they fly an inch closer to the table. Update: The Attack Wing posts fit together to create extensions. You can use the extensions to show a creature’s altitude. This makes the Attack Wing figures more versatile than the ordinary miniatures. When I first saw pictures of Game Force Nine’s fifth-edition Spellbook Cards, the cards seemed like a strained effort to find something to sell for the new edition. After all, friendly neighborhood game stores everywhere still have fourth-edition power cards gathering dust, marked 50% to 75% off. My assessment changed. I plan order the Spellbook Cards at my FLGS. My new outlook stems from my post on not hoarding spells, the new players at my D&D Encounters table, and my wish to avoid total party kills. Battles keep turning against players, while their spellcasters choose cantrips over the spells that could win victory. In fourth edition, complete power descriptions appeared every character sheet, so players never failed to use their dailies and encounter powers. Now the spell descriptions stay locked in the Player’s Handbook. Players skip their unfamiliar spells and spam Firebolt. I plan to hand new spellcasters a few spell cards that can help them tap their character’s potential. I hope to avoid dead characters and reduce the need to coach from behind the DM screen. The cards may help me too. I will pull spell cards for enemy casters and clip them to my DM screen. No more pausing the action so I can search for a spell description. 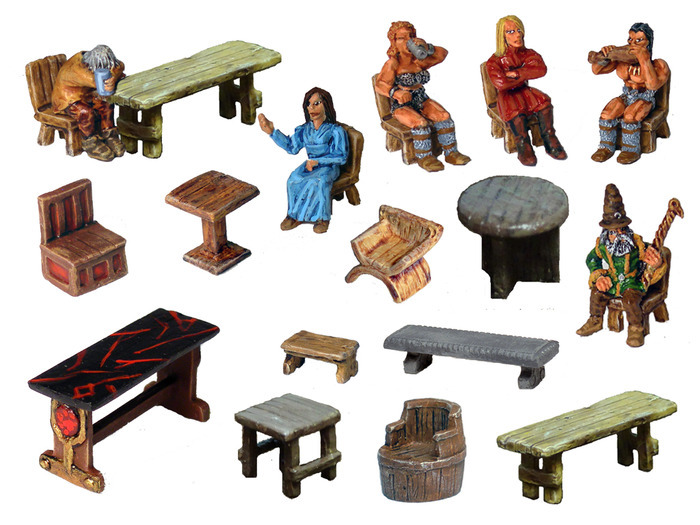 I collect miniature figures for unarmed non-player character, from royalty to beggars. Setting them on the map helps set the scene in a tavern, street, or throne room, plus the figures discourage players who tend to think every NPC with a miniature represents an enemy to fight. In addition to miniatures for non-combatants, I’m enchanted by miniature-scale props that sit on a battle map and make the game more vivid. The Kickstarter for the Dungeon Decor Tavern set suits me perfectly. I added on to my pledge for extra tables and chairs. Players often move their characters over tables and chairs printed on a map as if they present no more obstacle than a rug. Your armored dwarf is not so light on his feet. If my next bar brawl includes 3-D tables and chairs, I’m certain the players will treat them as terrain rather than as a colorful pattern. This entry was posted in Dungeon master's tools, Miniatures and tagged Attack Wing, Gaming Paper, Spellbook Cards. Bookmark the permalink. Thanks for the resources DM David! I DM for my son and a handful of his friends. We’re working our way through Hoard of the Dragon Queen right now. The spell book cards are a fantastic recommendation. I’m hoping they are going to stream line the play of magic users and really help to “tap their character’s potential.” So well put! I really enjoy your posts! I’m happy that my suggestion proved useful. When 4E power cards spelled out characters’ abilities, new players made better use of them. The spell cards should do the same with this new edition. Thanks for the kind words! Thanks for the Blog Post David – interesting reading as always. Thanks for the tip on the base sizes. I did not notice that the frost giants were on bases that were too small. I will fix that issue, it would be nice of someone sold plastic rings you could glue on permanently without ruining the original base of the mini. 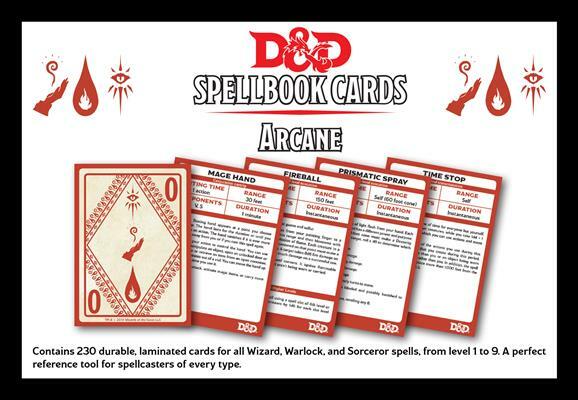 I would LOVE to get a set of those spell cards, but my FLGS has been out of stock since they were released – and it looks like it will be a while before a reprint will be coming. Thanks for commenting. Apparently, I’ll have to wait too. My local store’s distributor is out of some sets too. 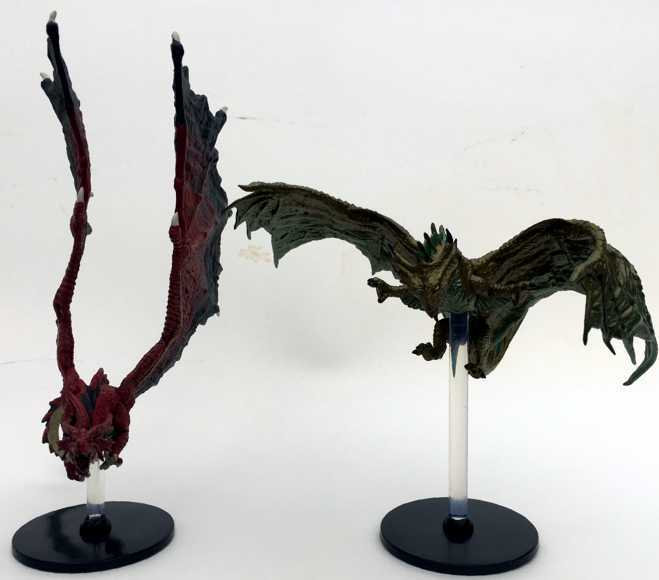 I love the blog; I just wanted to point out you can also use multiple Attack Wing short posts to increase how far off the table the dragons are flying – I think it comes with three posts per figure? The differing heights help a little to keep the minis from colliding when the official Attack Wing game rules indicate only the base is supposed to matter. 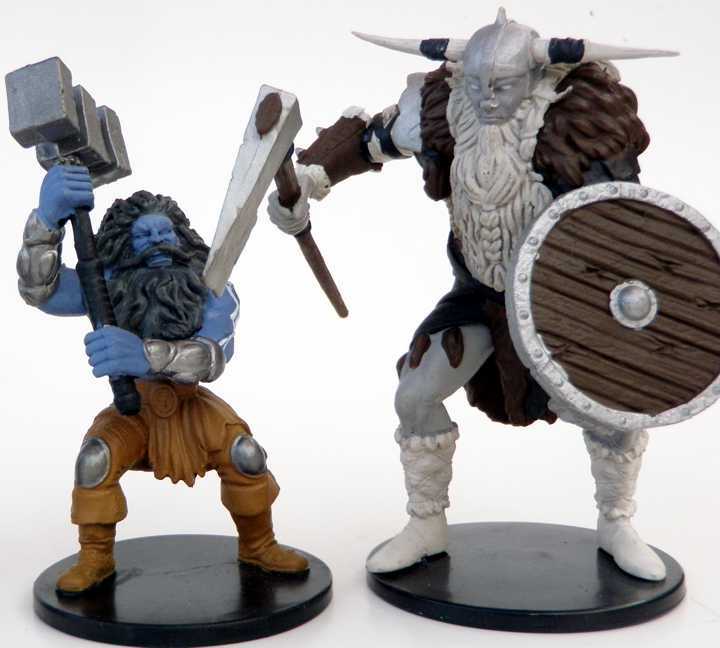 And oh man, that tavern miniature set is tempting, and I’m not currently a DM. Thanks for adding that key detail! I failed to notice the extensible posts. With the extensions, you can give a sense of a flyer’s altitude. This makes the Attack Wing figures more versatile than the ordinary miniatures.